Feel free to use this contact form for any questions, comments or order inquiries. If you're looking for something specific i still operate with the "tell me what you need and i'll tell you what i got" method. 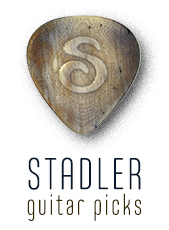 Besides creating picks for bespoke orders I also always have a large selection of pre-made custom picks in stock and can recommend an apropriate selection if you give me a little bit of information about your playing styles and pick habits. For custom and gift orders please contact me well ahead since there is currently a waiting list. into this field: and press By using this form you agree with the storage and handling of your data by this website.